Am I the only person in the world that loves Anne Hathaway? I’ve loved her for what feels like forever and every time I see her in a new movie, I love her even more. Why do people hate her so much? What the hell am I missing? 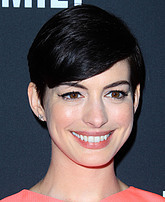 Anne is beautiful, talented and, in my opinion anyway, extremely likeable. Seriously, someone needs to explain what’s so objectionable about Anne. I just don’t see it. I mean, just look at her in these shots. Adorable. I love you, Anne – even if I am the only non-crazy person in the world.